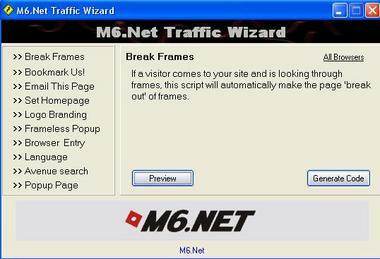 The M6.Net Traffic Wizard is a free site management/creation tool that makes the life of the developer and web master a lot easier. 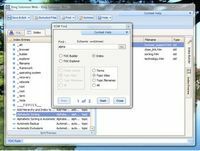 The software allows you to generate highly customizable code that works on most major browsers, like Internet Explorer, Firefox, Netscape Navigator etc. Bundled with 10 separate functions, the software is aimed at making web page development/management a lot easier and faster. The software lets you create code that can Bookmark a page or set it as the Home Page, Email the page to someone, Break page frames, create frameless & Pop-Up windows, Redirect users to a page according to the type of browser or their language, Create a search form for your site that connects to 42 major search engine on the internet, Put a floating logo on your site. There is also a very handy preview function that lets you see how the page will look like on your website.